Sometimes we find ourselves between two opposing camps of believers. Let’s call them Gospelites and Culturites. Gospelites emphasize the crucial importance of bold gospel proclamation. They maintain that urgent and bold evangelism is far more important than studying the culture. Culturites, on the other hand, emphasize the necessity of cultural fluency in order to communicate the gospel faithfully. They insist it is crucial to know the culture in order to do gospel work well. Gospelite or Culturite: Which Side Better Fits You? Do we have to choose? What if we were raising up an army of laborers who are both gospel-bold and culture-wise? A right understanding of the relationship between gospel trust and cultural savvy frees us from this false choice and sets us on a powerful path for ministry. First, all our trust must be in the sufficiency of the gospel. It alone is the power of God for salvation (Rom 1:16). The gospel proclaims a holy God who saves sinful yet repentant men and women who believe in the perfect life, sacrifice, and resurrection of Jesus Christ. This message is true for all people of all neighborhoods, colors, and nations. Therefore, it must be the foundation, the cornerstone, the rope we grasp for dear life in all our ministry efforts. But if the gospel is true, we can have steadfast confidence to do the work of the ministry regardless of cultural context, from day one. We have no fear; there is nothing to keep us from speaking gospel truth to the souls of mankind. This reliance and trust in the gospel releases us to share boldly and urgently. It frees us to be creative risk takers because we don’t trust our cultural expertise – we trust the gospel, and in that there is freedom to struggle forward in ministry. This is where some stop. But it’s our trust in the gospel alone that compels us into a diligent engagement with the culture around us. We should work harder than any in becoming culture experts because we are utterly free. Through Christ, we have been made sons and daughters of God–waiting to inherit the whole world! Sons work harder than the slaves, for they work from love, gratitude, and hope for a glorious future. It’s our freedom under the grace of Christ that enables us to enter this world not to be conformed but as those who are being transformed (Romans 12:2). Let us then strive in our cultural context in the following ways. The deeper our understanding of a culture and a language, the greater our ability to make the gospel clear. Do not assume that your hearers clearly understand your gospel sharing just because it is clear in your mind. What if their backgrounds have infused important words like sin and repentance with wrong definitions? What if their educational, societal, or worldview background is significantly different than yours? Gospel clarity in our proclamation calls for the study of the culture of our hearers. The gospel is the most compelling message in the universe, yet for many it is initially foolish and shameful. However, every broken culture has providentially held onto certain gospel categories, analogies, and values. Studying culture helps us to discover these divinely-implanted areas which we can use to connect and illustrate gospel truth. Perhaps there is a famous myth in the culture, a sound proverb, or a traditional custom that will provide the key to a listener hearing the gospel story as beautiful and compelling, even if they are not yet ready to say it is true. Studying culture helps us to aim for the heart. We are called to outdo one another in showing honor (Rom 12:10). Cultures differ wildly in how honor is given and received. Should we use titles or first names? What seats are considered more honorable? What kind of clothing and body language communicate respect? Whatever your posture toward culture, we want to communicate respect toward our hearers as those who are made in the image of God. We, like they, are equally under the curse of Adam and equally invited to partake in the salvation of Jesus. By studying the culture of our hearers, we communicate honor and equality, helping us to avoid a colonizing mentality. All cultures are equal at the foot of the cross where all men are called to repent and believe. We must know the culture in order to make intentional choices about what rules we will keep and what rules we will break in order to preach the gospel faithfully. Cultural ignorance will lead to lots of broken cultural rules on accident. But we, like Jesus in John 4 with the Samaritan woman, need to know when we are breaking the cultural rules so that we may do so with intentionality and powerful effect. My family serves in an Islamic context, and we eat pork—not significant in the United States, but transgressive in our parts. Somehow, pork always leads to a conversation about scripture and the gospel! Knowing the culture means we can leverage its rules to strengthen our gospel proclamation. Having a culture always comes with blind-spots. If we are not careful, these blind spots can enslave our hearers in other cultures to an unbiblical cultural system in need of exposure and transformation. We cannot break free from a prison we cannot see. Studying foreign cultures makes us more aware of our own background. Particularly for those of us from dominant majority cultures, let us be very careful not to allow any culture to hold our minds captive. 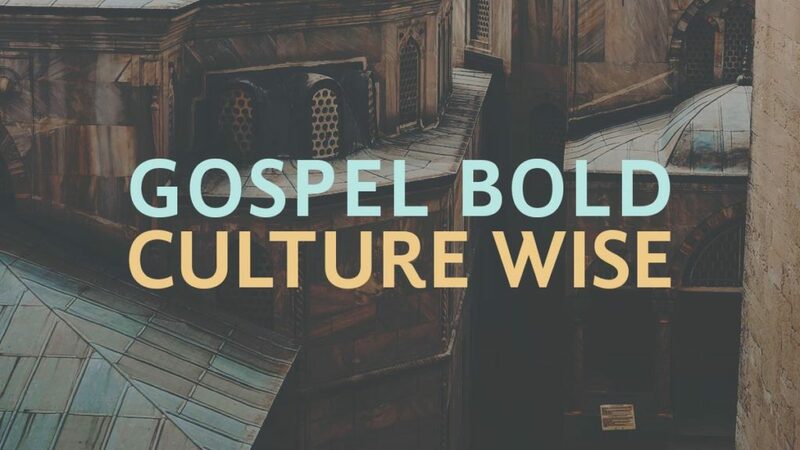 Should we be gospel-bold or culture-wise? Yes. Trust in the gospel alone and push hard into mastering the culture. This approach is powerful and faithful not only for overseas workers like me, but also for those doing ministry anywhere in the world. Humans always have culture. This will serve those seeking to build multiethnic congregations, those bridging rural/urban divides, those involved in racial reconciliation, those ministering to different generations, those trying to penetrate an unreached people group, and all of us struggling to grow in our own sanctification. Let us be known as a people who are radically free in the gospel and powerfully fluent in the cultures of those we strive to serve.